Agay is a village and coastal resort on the Cote d'Azur, on the coast between Saint-Raphael and Theoule-sur-Mer (Cannes direction). It is in a sheltered position in a large natural bay with the Pointe de la Baumette to one side and Cap Dramont on the other side. Occupying a natural bay overlooking the Mediterranean, Agay has a long main beach, backed by a string of small cafes and shops, and with villas running up the steep hill behind. Numerous sporting activities such as kayak and jet-ski are available on the beach. The beach is divided in two by a small headland that separates the 'main' Agay beach from the beach at La Baumette to the east of the bay and is perhaps a mile (two kilometres) long in total. As well as the main beach there are lots of smaller beaches and creeks along the coast here where you can enjoy yourself in virtual solitude away from the crowds at Agay beach. 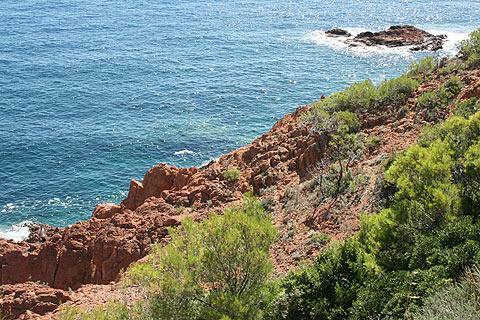 Several of them are backed by the lovely red cliffs and pine trees typical of the Cap d'Esterel. Our favourites are those to the east of Agay near Trayas (direction Theoule-sur-Mer) but you will enjoy exploring them to decide for yourself! 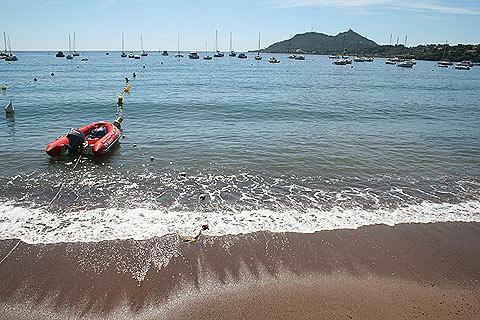 There are basic facilities here, including a few small shops and restaurants, but Agay is a much smaller, quieter beach and resort than its more famous neighbours along the coast. There is a small pleasure port around the mouth of the Agay river. Agay market takes place on a Wednesday. France This Way comment: Agay village is not very interesting but the beaches, coastal scenery and impressive cliffs of the Cap d'Esterel provide aequate compensation! The main appeal of Agay lies in its position - it is on a very scenic section of coast, with impressive coastline and numerous photo opportunities in both directions, and with the great red cliffs and rocks of the Massif de l'Esterel rising immediately behind and around the town, running down to the sea itself at either end of the harbour. The hill to the east is called Antheor mountain while to the west, with a lighthouse on top, is La Dramont - there is a walk along the coast and round La Dramont which takes a couple of hours and is very pleasant, especially for the views from the lighthouse itself, and the views across to the Ile d'Or (with a red tower on) from the Port de Poussai. More challenging walks are also available in the Massif de l'Esterel - a reasonably early morning start is recommended, it can get very warm in the afternoon! Note that unlike most places we review on France This Way, Agay is not a French commune but is part of Theoule-sur-Mer: it doesn't make much difference but useful to know when you are using a GPS to get here! 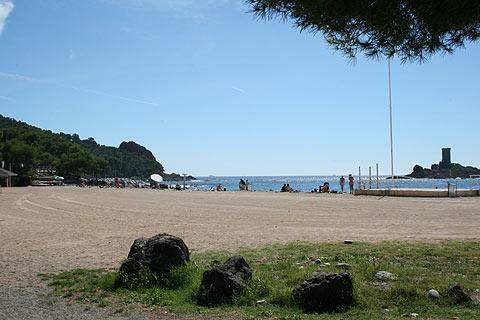 To the west of Agay you can visit the lively and well maintained resort at Saint-Raphael, one of our favourite resorts along this part of the French riviera, and to the east you will also want to visit the resort at Theoule-sur-Mer.